Recently I was at the World Alliance Forum in San Francisco (WAFSF), a great meeting on stem cells and regenerative medicine. WAFSF had some excellent talks and I saw one session on the use of stem cells to treat vision impairment that was particularly striking. This session’s all-star lineup included Drs. David Hinton, Ann Tsukamoto, Henry Klassen, and Masayo Takahashi. I’m going to summarize the talks below with permission of all speakers. Note that these summaries are based on rapidly scrawled notes. Together these talks show just how far the translational stem cell vision field has come in the last few years and the very real promise for the coming years in this area for major clinical impact. The session began with Hinton (pictured at left in USC photo) from the Project to Cure Blindness at USC, who spoke about research on treating geographic atrophy using retinal pigmented epithelial cells (RPEs). Hinton’s stem cell device is a polarized RPE monolayer. The team places 100,000 RPEs made from human embryonic stem cells (hESC) on a parylene membrane. My impression was that they are using H9 hESC for the preclinical studies, but I’m not 100% sure. He indicated that because of the membrane there is no significant cellular migration, but there is PEDF and VEGF secretion and the RPEs appear resistant to stress. Are the RPEs functional? It seems so as there is rhodopsin phagocytosis. For the studies he discussed, they used the RCS rat model of retinal degeneration of which there was a partial rescue by hESC-RPEs and encouragingly from a safety perspective, no teratomas. Surprisingly, control parylene alone without cells has some rescue function, but with RPE there was substantially better organization and electrical function. One kind of cool thing from a techno perspective is that they invented a special delivery tool that gently folds the RPE sheet for insertion into the eye upon which it unfolds. It looked like it worked like a charm based on a video shown. What does the future hold for this project? They hope to file an IND within a few months and the target for starting a clinical trial is 2015. There was a question from audience on IP navigation. They have a license deal with WARF and they are aware of the ACT patents (now known as Ocata Therapeutics), which presumably will need to be addressed in some fashion such as licensing. Another question was on residual undifferentiated ESC. Shouldn’t be a problem, he said, because the special media that they use causes ESC death. 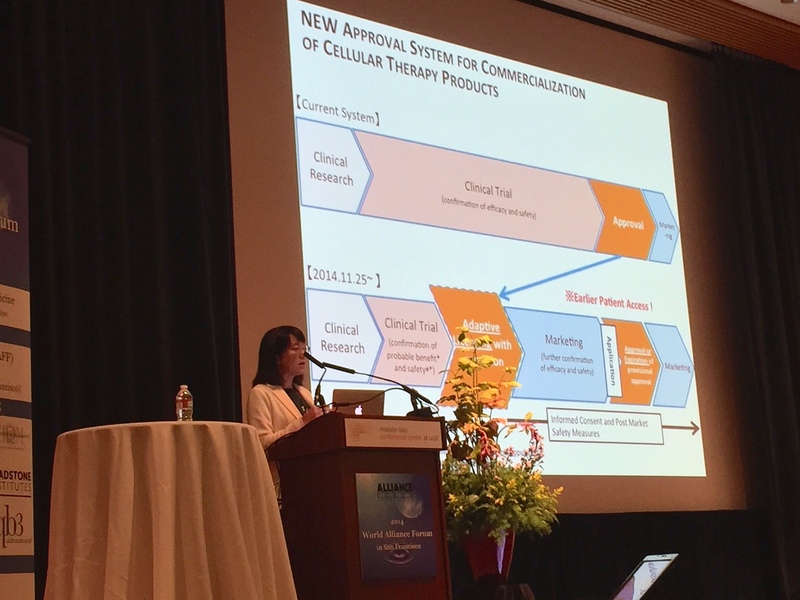 The next talk was from Ann Tsukamoto of StemCells, Inc. They are studying the use of human CNS stem cells for treating dry eye AMD. These cells are called HuCNS-SC. After transplantation in mice the cells engraft and migrate. In RCS rats there is loss of RPEs and then 2ndary loss of photo receptors. HuCNS-SC transplanted at P21 migrate well (there’s no matrix). With transplant of HuCNS-SC they see maintenance of photoreceptors and visual acuity. What is the mechanism? One is suggested by the observation that the cells have phagocytosis function and debris is absent. They hypothesize that as a result there is preservation of synaptic connections. They have a combined phase I/II trial going, which includes a 3-month immunosuppression regimen. They have done 6-12-month follow up on 7 patients and found encouragingly no cell-related safety concerns. Best corrected visual acuity (BCVA) improved in 2 study eyes, but also in 1 control eye. They found that 6/7 treated eyes had 70% reduced geographic atrophy. I’m curious to see how this work goes as it continues to develop. HuCNS-SC may have utility to treat other diseases as well. Henry Klassen from the Gavin Herbert Eye Institute at UC Irvine spoke next (photo from UCI). 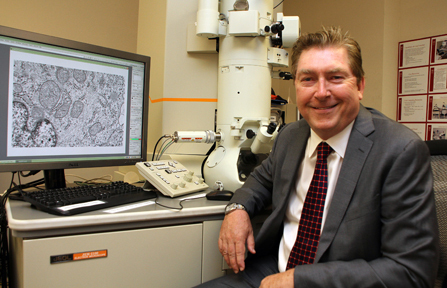 Klassen’s team is studying the use of fetal retinal progenitor cells (RPC) for treating retinitis pigments (RP). In RP there is loss of photoreceptors and loss of cones by bystander effect, Klassen said. Because of the importance of cones, the goal is to try to rescue them. This team produced their stem cell-based product here at UC Davis in the GMP facility. The RPCs, which are not immunogenic, are injected into the vitreous. They used the same RCS rat model as the first two speakers. They transplant the RPC as a single cell suspension but cells aggregate after transplant into neurospheres that float around in the vitreous and secrete cytokines. It’s like a floating pharmacy (my analogy). They observed that the RPCs rescue rods and cones in rat. Their goal is to have an IND before the end of the year. They have done the work in part with funding from CIRM and interestingly have founded a company called jCyte. One pretty neat additional point was that this therapy has the potential for treating AMD too and would be complimentary with other types of therapies such as those mentioned by the first two speakers. I didn’t have a have chance, but I had hoped to ask Klassen if they thought that patients would be able to see (or not) the neurospheres like little floaters in the eye. The final speaker of the session was Stem Cell Person of the Year, Masayo Takahashi, from RIKEN. She spoke about using RPEs made from human induced pluripotent stem cells (IPSC). She discussed treating wet AMD with the RPEs. I understood that to make IPSC they used the episomal vector approach. They started with 24 IPSC lines, then picked the top 6 and then 3 of those lines were used to make the RPEs using a 4-month differentiation period. Of the original 6, it was notable that despite using an episomal vector, in one there was a plasmid remnant. So for all you folks out there using “transient”, “non-genetic” methods, one lesson here is to be sure to do the needed testing and validation of human IPSC lines. They then pick pigmented clones and made sheets. It’s a lengthy and expensive process with one of the biggest expenses being the facility itself, which costs ~$500K/year just to run. For safety testing and validation, they did their Lin28 PCR assay for residual IPSC as well as whole genome sequencing. In addition, no tumors were observed. The RPE product, a 1.3 x 3 mm wide device, was just transplanted recently into the first human AMD patient. I think everyone is on the edge of their seat in this field to see how this clinical study progresses. Looking to the future, Takahashi mentioned that allogeneic transplantation is an option and teams are moving in that direction. An IPSC cell bank with a variety of HLA types could be helpful to many patients in an allogeneic manner. She also discussed the regulatory situation in Japan including the novel concept of adaptive licensing (see below the overview of the current regulatory system in Japan). She mentioned that it is a fast system, but acknowledged that it has risks too. She also said they are planning photoreceptor transplantation in 5 years for RP. Overall these four talks were very encouraging for the future of treating various forms of vision impairment using stem cells. I would question the risk analysis with mitigation that would include IP legal searches along with ROI and COG for marketing these techniques from a business non scientific approach. Grant it they are at the all early research phase…..none have INDs written…..
Are iPS cells being rushed to the clinic or has their time come? The iPS cell field has run fast and furious over the past 6 years reaching a big milestone surprisingly quickly on Monday with Shinya Yamanaka winning the Nobel Prize. But is the field going too fast? In August I argued that iPS cells are not quite ready for primetime (i.e. clinical trial studies). Now in October I mostly feel the same way. But reportedly, some iPS cell researchers are working to start clinical studies wherein iPS cells would be transplanted into human patients as early as next year in Japan. This is both exciting, but also potentially very risky if not flirting with disaster. It would be tragic if the excitement and creativity exploding from iPS cells became diminished in the future by a rush to the clinic that harmed patients. 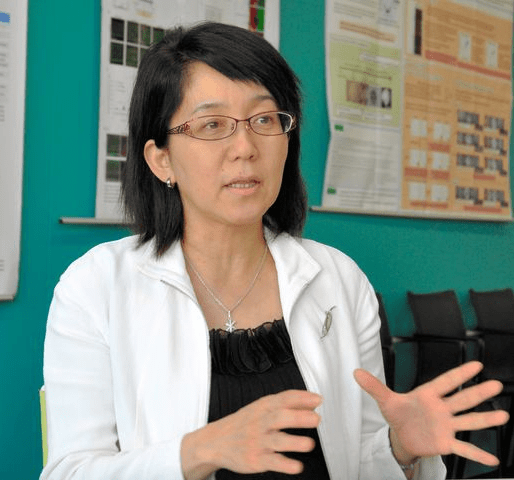 In her ISSCR seminar given 10 months ago, Takahashi presented some safety data from mice on the RPEs, but not from larger animals such as monkeys. To be clear, larger animal studies are not also not required, but this is an important distinction since larger animals are sometimes better models for humans and also because there were some anecdotal reports that said she had in fact presented larger animal pre-clinical safety data at the ISSCR meeting. My understanding from Geron’s and ACT’s experience at the FDA here in the US is that the short-term nature of this iPS cell safety data along with very low animal numbers and lack of a clinically-relevant transplantation paradigm would be far from satisfying regulators here in the US that human studies should begin. Unless there are a lot more, longer-term studies (e.g. 1 year or even longer) done on many more animals (e.g. 100s) yielding equally encouraging safety results specifically on transplants in the retina (not just sub-Q teratoma assays), I am deeply concerned as to whether the field is really ready to make the jump to transplanting iPS cell-based therapies into people any time soon. Paul, do you really, SERIOUSLY feel that only a year and a half later, anyone is really ready to transplant iPS cells into human beings? Isn’t a year and a half later “anytime soon?” (XXXX edit) Don’t you think there’s at least a real chance that these scientists are rushing terrifyingly and dangerously fast into human trials? I really hope that everyone who reads this thinks seriously about these issues. I’m afraid that we will all end up being sorry that IPSC human trials moved so fast. It’s so easy to get caught up in the excitement, but that doesn’t mean that it’s right or safe. Cathy, you raise some reasonable points. For innovative therapy development there is always going to be risk and a tough question is how much risk is acceptable and how much is too much? From what I know now (more than in the past), I’m more encouraged about the safety potential of IPSC-based treatments. But as Takahashi herself says, this is risky. Paul, thanks so much for replying! 🙂 I love your blog and your book, and I think you’re doing such a valuable service to the public by translating a lot of information and ideas into a user-friendly form when it comes to stem cell issues. I have an MSW, but I am not in the hard sciences at all– and it STILL makes sense to me, mostly, anyway! I just can’t help being nervous about this iPSC transplant issue. I would be incredibly happy to be wrong, and I really don’t want to make prophecies of doom. But… there are aspects that I do feel are being rushed. I’ve gone over all of the papers that Takahashi has published/had an author credit on in the past year and a half, and what I don’t see are the long-term, over one year long studies with hundreds of mice. There was only one study done that used exactly ONE monkey. I’m just afraid that it’s all happening too fast. Again, I will gladly walk around in the official “I Was Wrong” t-shirt if this study is a safe success. I just feel that it’s a good thing, too, to raise some concerns. If people are really paying attention to the various stem cell transplant work going on more generally and being honest with themselves, they should feel nervous about this stuff. It’s exciting, but also scary.